If you put it in front of me, chances are I would have done it. And if I liked it, which I invariably would’ve, then I’d keep doing it until I passed out or we ran out. Like many of my friends growing up, I wasn’t exactly the most discerning connoisseur of illicit substances. If someone told me it’d get me high and it was available, then I was usually game. When you’re a teenager, it’s not like you have any legal options when it comes to substances of the mind-altering variety. There’s an absence of moral relativism in youth substance abuse that just isn’t there once you turn 21. To a 17 year old, getting caught with a loaded bong is just as illegal as being apprehended with a fifth of bourbon. Before I reached the legal drinking age, all I was doing was playing hopscotch from one drug to another based on what I could get and when I could get it. With some rare exceptions, forethought and deliberation aren’t the strong suit of the modern teenager. Neurologists have recently found out what insurance underwriters have known for decades: namely, that the development of that lovely little part of the brain responsible for decision-making and planning known as the frontal cortex, doesn’t fully mature until the age of 25. To a large degree, youth substance abuse is not a matter of psychology; it’s a matter of biology. To a certain extent, it is hard-wired into teenagers to be irrational little hellions with no regard for personal safety. God knows when I was about to go to college I wasn’t thinking about my respiratory or liver health 40 years down the road. Kids think they’re invincible because they have yet to be proved otherwise and because long-term consequences have a lot less sway when juxtaposed against short term pleasures. Scooby Snax brand Spice. I wonder who their target demographic is? This past Tuesday, I attended a small community forum for Washington DC’s Wards 5 & 6 that was hosted by the DC Prevention Center to highlight local youth and their efforts to fight drug abuse in their neighborhoods. It really was a wonderful event, with a number of great speeches from important advocates like DC Congresswoman Eleanor Holmes Norton, Office of National Drug Control Policy Deputy Director for the Office of Demand Reduction, David Minetaand Interim Director for the DC Department of Health, Dr. Saul Levin. The focal point of the forum was synthetic drugs and the inroads that they’re making among youth in DC and across the country. The synthetic drug that you’re most likely to know of is Bath Salts, which have made national headlines for the psychotic and homicidal effects that they have been known to have on users. However, what may turn out to be a bigger public health problem is the widespread use of synthetic marijuana. While it hasn’t received the same type of press attention as Bath Salts, synthetic weed has negatively impacted a much wider range of people, ranging from teenagers to military personnel. The first time I ever personally encountered synthetic cannabis—commonly known as Spice or K2—was when I was working as an orderly in a halfway house for paroled felons in the fine state of Kentucky. As would be expected in such a facility, all inmates were given “random” drug tests to see if they were breaking the conditions of their parole by indulging in a little illegal chemical recreation. The lab that we sent the piss tests out to checked for every drug under the sun with a few notable exceptions, the biggest of which was Spice. Somewhere down the line, drug users who were under the thumb of some sort of anti-narcotic authority—be they soldiers in the US Army or parolees from our Federal prisons—discovered that they could smoke synthetic weed and it wouldn’t show up on a drug test. And since you could purchase it legally from head shops and gas stations, it was a risk-free high. Now, I should point out that people rarely smoke synthetic weed by choice. It’s not like this stuff is some kind of hyper-potent robo-weed that gets you twice as baked for half the price. To a man, every single person I’ve ever talked to who has smoked Spice has told me that they would much rather smoke good ol’ fashioned grown from the ground marijuana. Spice generally has a longer period of effect on the smoker and the high is often more intense than regular weed, but the synthetic cannabinoids used to make Spice have a tendency to illicit a large array of side effects in users ranging from the minor to the fatal. Subjectively, many of the people I’ve spoken to have cited a tendency to develop headaches after using synthetic weed and say that the high is much less enjoyable. In terms of the raw science of the drug, numerous studies have shown that there may be links between synthetic marijuana use and psychosis, convulsions and heart attacks. Spice is a drug of necessity, not a drug of choice. It is the fact that Spice is the drug of last resort, so to speak, that makes it especially dangerous for kids. The best thing that synthetic marijuana has going for it from a user’s perspective is that it is obscenely available. Walk into any gas station or head shop in the greater Washington DC area and you will likely be able to buy a package of spice for between $10 and $30, with no ID required. Hell, you can send in your 12-year old nephew to buy it for you because Spice isn’t a tobacco product and isn’t regulated by the FDA. As a matter of fact, most packaging for synthetic weed says on the label that the product is not for human consumption in an effort to get around regulations. For a kid looking to get high, it’s a no-brainer. Spice is available, it’s cheap, it’s legal, and their parents and teachers have no idea what the hell it is. For sheer convenience alone, Spice has become a major player in teen drug use and don’t think the makers of synthetic marijuana don’t know it. 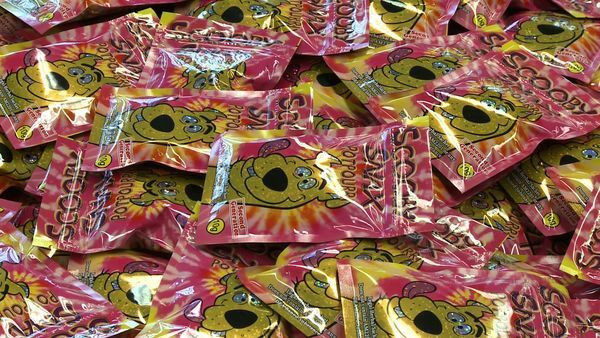 Among the various brands of Spice on display at the DC Prevention Center’s event on Tuesday was one dubbed “Scooby Snax,” which featured a picture of Scooby Doo in front of a tie-dye background and another was of a bleeding cartoon chimpanzee called “Fucked Up Monkey”. This is the second coming of Joe Camel, only a whole lot worse. Regardless of your position on the whole legalization debate, I think that we can all agree that: (a) no one under the age of 18 (or 21) should be allowed to ingest marijuana in any form and (b) that drug use hampers the development of the adolescent brain. Not to go all scared straight on you, but I knew this kid named Justin who had just been admitted to a adolescent drug treatment facility a few years back. Justin was 17 and had spent the entirety of his adolescence up to that point getting baked out of his mind. When I met him, he was about 24 hours clean and still very much in that cannabinoid haze particular to especially prolific potheads. Over the course of the next few days, I observed Justin’s behavior and noticed that he spent a good deal of time writing in a small black notebook that he carried with him wherever he went. After I got to know him, I asked Justin what he was writing about in his notebook and he told me that he had to write down the names of everyone he met and the times he had to be anywhere because he would forget them almost as soon as he had heard them. Justin had torched his short term memory to the point that he needed to compliment it with running notes of his life. My point is not that if your kid smokes weed that he is going to end up a 15-year old Mr. Magoo. Justin is an extreme example and his short term memory began to return as the weeks went by, although I’m sure there was some damage done to his brain development from such heavy use. The reason that I bring Justin up is that the brain is a remarkably fragile organ that has more synapses than your body has cells. We are just beginning to understand the neuroscience behind how our brains develop and we have a paucity of information on how drug use effects that development. With that being said, we have no idea what synthetic weed does to the adolescent brain. Actually, we have no idea what synthetic weed does to the adult brain either. When someone smokes Spice they are ingesting a combination of mystery chemicals found nowhere in nature. A consumer quite literally has no idea what it is that they’re buying when they purchase Spice and they have no idea how it is going to effect their bodies. The fact that a child can go down to Shell or BP and buy a toxic designer drug for the price of a movie ticket is appalling. Spice is not drug issue. Spice is not a moral issue. Spice is a public health issue. I wanted to thank you for this great read article! I definitely enjoyed every little bit of it.